Our top seller, with more tools you need to succeed. What you need to get started with your plan. 500+ sample business plans to inspire you, help and guidance every step of the way, and a money-back guarantee if you're not satisfied. 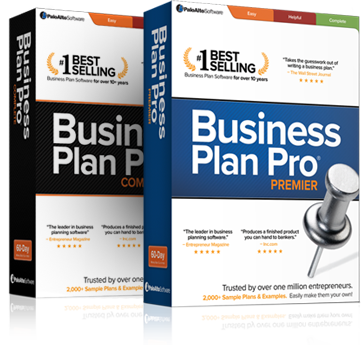 Business Plan Pro has been the #1 best-selling business plan software for ten years straight. Find out why in this quick recap of its key benefits. The underlying financial model makes your numbers sound, while step-by-step wizards and visual forecasting let you fill in the numbers in an intuitive format. Say goodbye to writer's block! With Business Plan Pro, you get over 500 complete sample business plans you can use for inspiration or edit directly. More than a million entrepreneurs have used Business Plan Pro. That includes everyone from first-time business owners to leaders at more than half of the Fortune 500. Included with your purchase are two best-selling books, research data for 11,000+ industries, a free company logo, an Inc. magazine subscription, and more. Business Plan Pro has been rewritten from the ground up to take advantage of new technologies and to remain current with new trends in business planning. Our software walks you through the entire planning process with clear instructions and advice at every step. Additional help and resources are available throughout. Tim Berry is an expert business planner and principal author of Business Plan Pro. His expertise guides you through every step of creating a complete business plan. The Plan Review checks key sections of your plan to see that you have realistic growth rates, a solid break-even analysis, manageable cash flow projections, and more. Industry profiles on virtually every industry are included. Match your numbers to industry ratios for an accurate business plan. That information is integrated automatically into your plan.